Guess who's back? Back again! I know I haven't blogged for ages, I am so annoyed with myself! I have been SO, SO busy!! If you follow me on Twitter you will know I am currently looking after my mum's chihuahua whilst she is in Greece and with a toddler thrown in the mix I spend 99% of my free time pulling them off of each other! As well as splitting up dog vs toddler fights, I am in the process of moving house and just started a new job! VERY VERY BUSY! Don't judge me, I have lots of wonderful content for you to feast your eyes on in the next couple of weeks and I am really excited to get stuck back into my little blog! 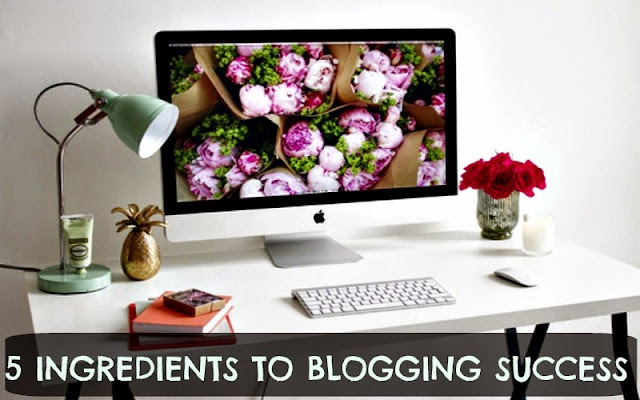 Today is another blogging 101 post, it's quite simply the 5 most important ingredients to running a successful blog. They are all very obvious points, but very important ones that I think all you newbs will enjoy so happy reading & I promise I will be back with more sooner rather than later! Being organised is SO important in being a blogging success. I am the bloody worst person in the world at being organised when it comes to my blog. I am honestly the most organised person at work & with my family life but I just can't get on top of it with my blog. I am really working on it and I really see the damage my inconsistency and neglect causes through my stats and my ad clicks. DON'T BE LIKE ME! Schedule, schedule, SCHEDULE!! If, like me, you're juggling a job, a toddler, planning a wedding AND moving house, you will know how difficult it is. My advice is on a day off, as soon as you find a space in your busy life just get your head down and bash out some serious writing. I am going to start doing this when everything is settled and I'm in my new house. Have a space where you can work too, without distraction. Make sure it's bright, clean and tidy so you can feel fresh and comfortable, ready to work. The more consistent you are, the more traffic you will draw in and the more followers you will gain not just numbers, but actual readers who can rely on your posts to give them a fix of their favourite blog. Design is a huge ingredient in the recipe to success. There is nothing more frustrating than clicking on a blog with poor navigation, adverts popping out of the screen and a poor layout for mobile. You can get amazing layouts on Etsy for a very, very reasonable price, my current layout cost just £2.80 and I absolutely love it. Make sure you get a layout that's very to the point and easy to find your way around. FONT! As much as we all love the swirly girly fonts, I can't read a word of it and it puts me off instantly, no matter how good your content is if it's barely readable people are going to give up on it! My advice is to use clear fonts (no yellow on white backgrounds) and clean layouts to ensure your readers can get the most out of your blog. If you follow me on Twitter you will know, I HATE PHOTOGRAPHY! I am not one of these people who buys food and instantly feels the urge to upload it on Instagram. I rarely whip out my phone for selfies, I don't own a 'selfie' stick or document anything I'm doing in my life, which you never ever would expect from a blogger. It has just never interested me, but as a blogger I am obliged to try my best to become more photo friendly and it really, really makes a difference to your content and to your following. People love pictures, I love pictures, I just hate taking them. Every single piece of content you create should have at least one picture. I often use creative commons, because I am just terrible. I am aware of how far it sets me back, so I am taking a course and window shopping with the commitment to buy a good camera. Do you think there's something more or equally important to blogging success? Leave me a comment below with your thoughts! HAVE YOU SEEN/READ MY BLOGGERS TO WATCH!? CLICK HERE TO FIND OUT WHO'S REPPING MAY! Networking is my next target. So glad you liked the post, let me know how you get on with Affiliate Window!! What a helpful post! What photography course are you taking? I'm booked onto one in September and I'm really excited already! !